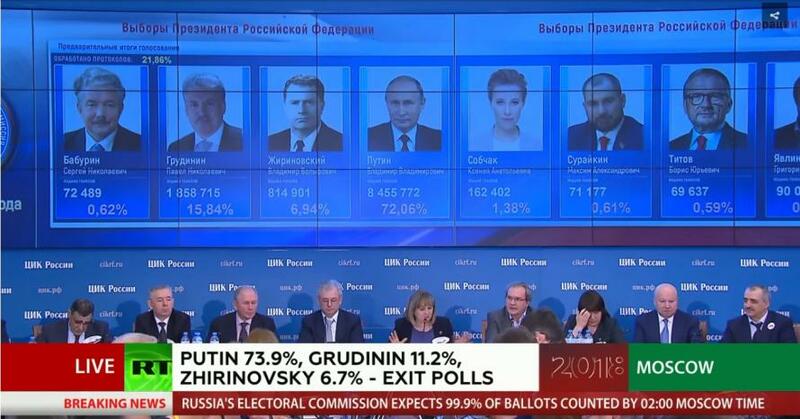 Update: As polls close in Russia, state-run TV is reporting exit polls (conducted by state-run VTsIOM polling company) showing a landslide victory for Vladimir Putin with 73.9% of the vote (above The Kremlin's pre-election whisper number of 70%). He faced seven minor candidates on the ballot. Putin's most vehement and visible foe, anti-corruption campaigner Alexei Navalny, was rejected as a candidate because he was convicted of fraud in a case widely regarded as politically motivated. Communist Party candidate Pavel Grudinin placed second with 11.2%. 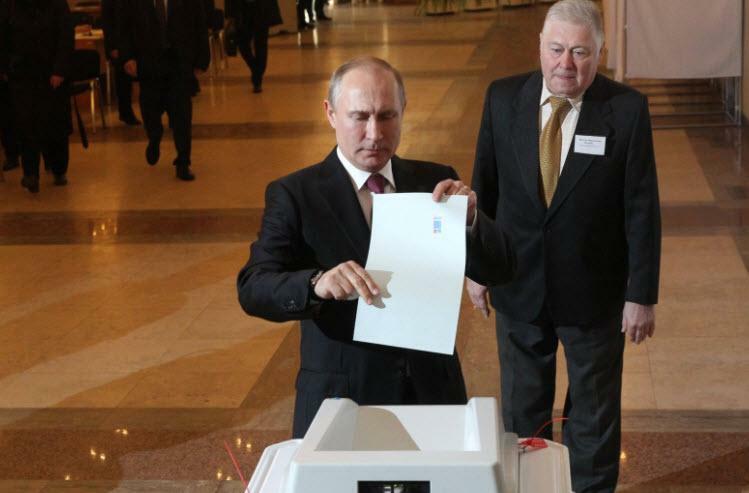 As we detailed earlier, Vladimir Putin is expected to win by a landslide in today's Russian election. As both prime minister and president, he is the second longest serving Russian leader since Joseph Stalin who was in power for 10,636 days. The last polls close in Kaliningrad at 2 p.m. ET. But, as Putin looks set to begin his fourth term in office, Reuters notes that, the only possible blemish for the Kremlin is if large numbers of voters do not bother taking part because the result is so predictable, and opponents alleged officials were compelling people to come to the polls so that a low turnout does not tarnish the win. Opinion polls give Putin, the incumbent, support of around 70 percent, or nearly 10 times the backing of his nearest challenger. 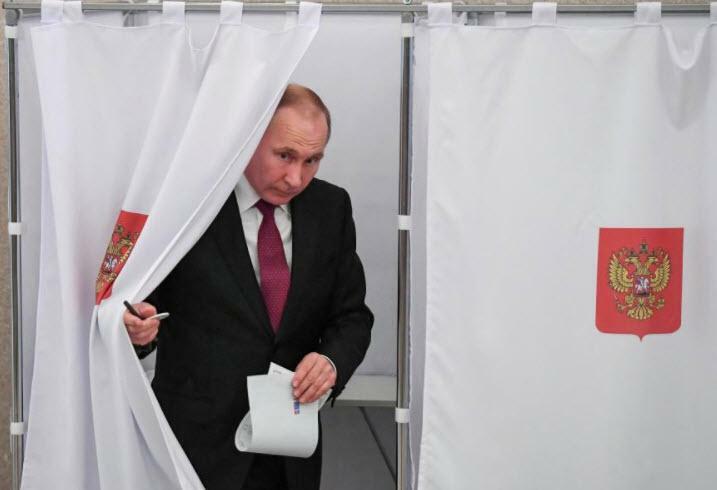 and Axios reports that The Kremlin had initially set a target of a 70 percent result for Putin with 70 percent turnout, though it may have backed off on that in the past few days. Reuters reports that turnout nationwide was at 51.9 percent by 1400 GMT, official data showed. A low turnout would diminish Putin’s authority within the ruling elite, which is founded in large part on his ability to mobilize the public behind him. “I voted for Putin,” said Lyubov Kachan, a teacher in the settlement of Ust-Djeguta, in southern Russia. “If anything is not going our way right now, that’s thanks to the world which treats us so negatively, while he is trying to stand up to that,” she said. The first politician in years to challenge the Kremlin’s grip on power, Alexei Navalny, is barred from the race because of a corruption conviction he says was fabricated. He is calling for a boycott of the election, saying it is an undemocratic farce. He said he would decide later on Sunday whether to call supporters out into the streets in protest. Nina Bostanova, a pensioner in Ust-Djeguta, said she decided not to vote. “What’s the point? They’ll get elected anyway. Why go and vote?” she said. The majority of voters see no viable alternative to Putin: he has total dominance of the political scene and state-run television, where most people get their news, and many Russians believe he has restored stability after the chaos that ensued after the Soviet Union collapsed. Despite his high approval ratings and lack of strong opposition, for many there is a big question mark over the legitimacy of Russia's elections. As Gallup surveys over the last few years have shown, even in Russia, those confident their elections are 'honest' are in the minority. Although the share of people trusting in the democratic process has increased since 2012, the results, as shown in the chart above, are rather damning. But, as Reuters reports, Ella Pamfilova, head of the commission organizing the vote nationwide, has said any fraud will be stamped out. She said those already alleging the election was rigged were biased and peddling “Russophobia”, echoing a line used by the Kremlin to describe Western criticism of Russia. Putin's predictable win, and possibility of remaining on office until 2024, may usher in a 'different' era for Russia as the leader plans for a Russia without him. In the West, Putin is labeled a narcissist, despot and would-be king for holding onto power for 18 years. But, as Stratfor details, rebuilding an empire out of the wreckage of the Soviet Union took time, and now he faces a string of pressing challenges that threaten his legacy and the future stability of Russia. His next term will look qualitatively different from his previous terms, as he maneuvers varying chess pieces for Russia's long game. Even at its most bellicose, Russia is an inherently weak country. Geographically, it is the largest state in the world, and transporting energy, food and resources across it is daunting. Throughout its history, the country has maintained a dependency on commodity exports. Russia is home to 160 distinct ethnic groups and indigenous peoples. And strong rival powers sit on or near its long borders. For these combined reasons, Russian leaders, like Putin, are forced to hold onto stability with an iron fist. Going into his fourth term, two large shifts — economic and demographic — threaten Putin's ability to maintain stability and his hold on power. Even at its most bellicose, Russia is an inherently weak country. 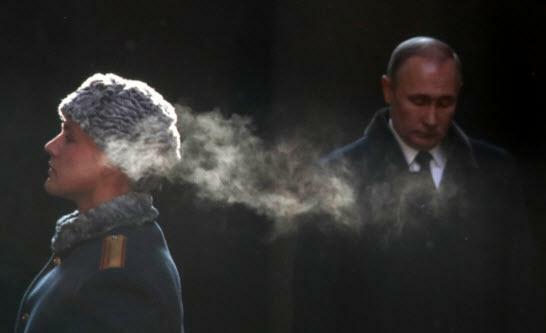 Putin's Social Contract. When he came to power, Putin brokered an informal social contract with the Russian people to maintain financial and economic stability. The contract includes dependable paychecks, secure pensions, a reliable banking system, state backing of strategic assets, and opportunities for the next generation. Russia's economic position shapes the loyalty (or at least the compliance) of the elites, the general population, and the military and security services. Under Putin, Russia has bounced back relatively well from economic hiccups; however, the country currently is settling into a prolonged period of post-recession stagnation that is reverberating across the country. Russia's poverty level is rising at its fastest pace in two decades, and its minimum wage is below subsistence levels. Average Russians are spending half of their paychecks on food, and more than 25 percent report regular interruptions or cuts to their salaries. The Kremlin blew through its Reserve Fund at the start of the year, and it is now dipping into the National Welfare Fund, which is intended to secure pensions. The Russian banking system also is rapidly shrinking, with the Central Bank having closed one-third (or 300) of the country's struggling banks over the past three years. The economy is overwhelmingly the top concern among Russians. Of the more than 1,100 protests in 2017, two-thirds were related to the economy. Signs held by protesters during widespread demonstrations in June 2017 called on the Kremlin to pay for bread, not bombs — a jab at Moscow's high-profile military interventions in Syria and Ukraine. Corruption also is driving disaffection in Russia, which ranks in the bottom 45 countries on Transparency International's corruption index. The Russian people largely ignored the rampant corruption of Putin and his cronies while the country thrived, but calls for an anti-corruption campaign against the Kremlin have grown, helped along by the popularity of opposition heavyweight Alexei Navalny and his anti-corruption exposes. A similar discontent is developing among the Russian elites, both within the Kremlin and among the oligarchy. The elites supported Putin as long as their fiefdoms were protected and growing. But now their business and financial opportunities are shrinking because of the stagnant economy and because of increased pressure from Western sanctions stemming from Moscow's foreign activities. Many elites have lost or fear losing their financial support systems (personal banks at home or the safety of cash abroad), and the Kremlin is increasingly taking on responsibility for those systems. This has sparked increased competition among the elites and diminished Putin's ability to curb or intervene in the battles. The most prominent example is Rosneft chief Igor Sechin's takedown of Economic Development Minister Alexei Ulyukayev last year for attempting to prevent the oil czar from snatching up assets — a move Putin forbade without effect. Other examples are the revived battles for the control of assets by the metals oligarchs and the unchecked transformation of Chechnya into a mini-fiefdom based on conservative Islamic values under Ramzan Kadyrov. Additionally, the large security services are flexing their muscles over key assets and portfolios, leading to a likely challenge in Putin's fourth term over the power to target other elites. Demographics. Putin's fraying contract with his people and elites comes as he faces another distinct challenge: demographics. The country's ethnic Russian population is in steep decline, with United Nations estimates predicting an overall decline of 10 percent by 2030. The decline is despite a sharply rising ethnic Muslim population, from 13 million in 1990 to a projected total of more than 20 million in 2030. This trend exacerbates social tensions between ethnic groups, particularly because many Russian Muslim regions, such as Chechnya and Dagestan, are heavily subsidized by the Kremlin, and many Russian Muslims are flooding the more ethnically Russian cities for jobs. This demographic shift also heightens the prominence of Muslim leaders, such as Kadyrov, and their ability to wield power. A generational change is gripping Russia as well, with nearly one-third of the country's population born after the fall of the Soviet Union in 1991. This demographic class has largely known only Putin as the country's leader, and it holds nearly no memory of the chaotic 1990s. The Russians currently coming of age are not anti-Putin per se, though they largely want leadership options instead of a blanket expectation of continued rule by Putin. A recent survey by independent pollster Levada found that only 15 percent of Russians ages 18-24 believe Putin serves the interests of the Russian people, and 74 percent believe Putin is responsible for Russia's problems. This new generation is social-media savvy, diluting the Kremlin's messaging to its people. Young faces have overwhelmingly populated protests in recent years, compared with the more middle-aged appearance of the 2011-12 protests. Demonstrations are increasingly organized on social media, making them difficult for the Kremlin to curb or disrupt. External Challenges. The deepening internal challenges facing Russia are juxtaposed with its efforts to maintain its position in the greater world. Russia faces an enduring standoff with the West, which only exacerbates the economic situation at home brought by U.S. sanctions. Russia is expanding its ambitious rearmament program, as a new arms race speeds up and existing arms control treaties are undermined. The country's national defense is an issue Putin repeatedly has refused to bend on, and he is injecting even more capital into the defense sector, despite a tight budget at home. The state is taking over responsibility for many of the defense firms so it can easily surge cash into their programs. As relations with the West continue to sour, Russia is shoring up ties with China and many Middle Eastern countries. Besides arms, Russia is investing in expensive energy links with Turkey, China and others to give it flexibility when depending on the Western energy market. Putin is attempting to position Russia strongly abroad to insulate the country from shocks at home. However, greater exposure on the world stage increases the attention of foreign players who can meddle in Russia in return. The Kremlin has tried to crack down on foreign attempts to reach into Russia via media and social media, but the government's heavy hand risks further inflaming discontent at home. The longer a leader stays in power, the more resourceful he or she must be to retain such power. One strategy that Putin is employing allows a degree of political debate to return to Russia after a decade in which debate was stifled by the censure of independent and foreign media, the assassinations and arrests of journalists and opponents, and the spread of state-controlled messaging. Questioning and dissenting points of view have started to surface over the past few years, even in state-backed media. The Kremlin understands that the Russian people — at all levels — require an outlet to voice their discontent and to promote their agendas. Relatively progressive political discourse can be heard from the protesters, the media, think tanks, business leaders and politicians, spreading across class and faction. This dialogue comes with a risk, and Putin's regime is tinkering with how far it allows these voices and views to resonate without backlash. The Kremlin is also toying with a plan to include various opposition leaders in government debates on both domestic and foreign policies to create a less antagonistic and more constructive opposition scheme. The longer a leader stays in power, the more resourceful he or she must be to retain such power. Discourse with opposition and independent factions comes as the government faces difficult decisions about how to address a spate of Russian woes. The Kremlin is considering a series of difficult reforms to the state budget, energy sector, security services and banking system. Which direction such wide-ranging reforms will go is not clear, but the Kremlin appears to be taking conflicting views into account. The return of political debate does not mean Putin faces a real challenger or formidable opposition yet. Instead, his true rivals are the challenges facing the country and the cultlike system he has built around himself. This has Putin — and much of the country — thinking of the future of Russia without him — a topic previously barred from most Russian media. Over the past year, a string of Putin-picked officials in their 30s and 40s have churned through key posts, from governors to ministers, in what is seen as Putin's tests for future leadership and higher office. Some notable standouts are Economic Development Minister Maxim Oreshkin, 35; presidential chief of staff Anton Vaino, 40; and Russian Agricultural Bank CEO Dmitry Patrushev, 40, whose father is also head of the Russian Security Council. In the Soviet period, Kremlin watchers studied the order of seating in the Politburo's boxes at the Bolshoi Ballet to gauge prominence and favor among the elites. Today, Kremlinologists watch Putin's hockey matches on Red Square or video of the elites' macho antics, such as footage from October that showed regional officials diving from cliffs. The appointments and exhibitions are Putin's way of tutoring this next generation for fitness for office and public appeal. 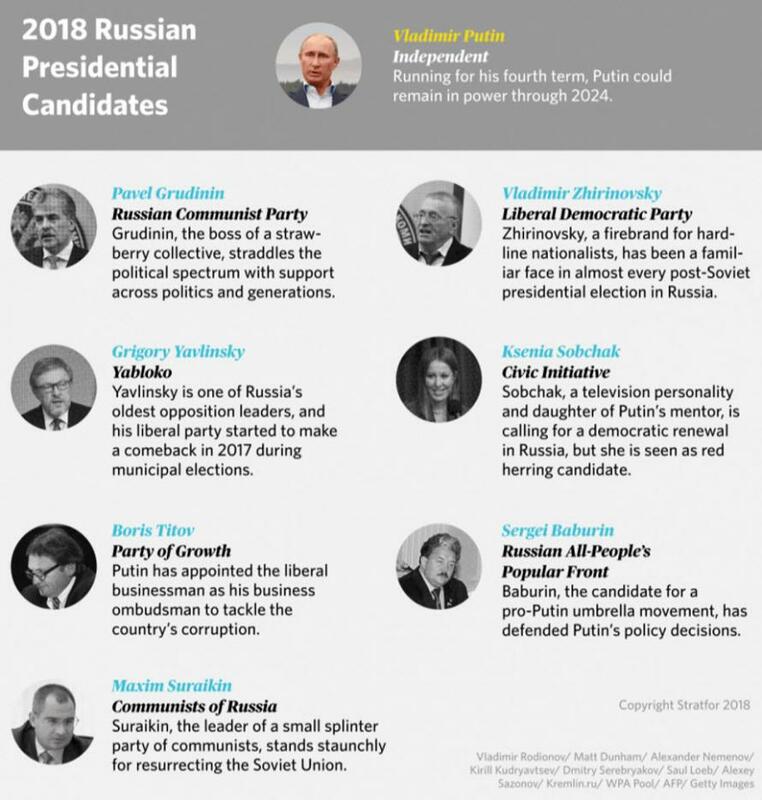 It's unlikely Putin will choose a sole successor, but he may attempt to turn the personalized system into more of a collective, much like a latter-day Soviet Politburo. Attempting to create a post-Putin system with Russia facing so many domestic and international challenges looks to become Putin's greatest test. Aware of Russia's recent history, Putin will attempt to succeed where other Russian leaders such as Leonid Brezhnev and Mikhail Gorbachev failed. The extent of his success will become clearer in the coming years, which will show the viability of Russia's continued stability and ability to maintain its place in the world.